Deep-sea mining is likely to result in biodiversity loss, and the significance of this to ecosystem function is not known. “Out of kind” biodiversity offsets substituting one ecosystem type (e.g., coral reefs) for another (e.g., abyssal nodule fields) have been proposed to compensate for such loss. Here we consider a goal of no net loss (NNL) of biodiversity and explore the challenges of applying this aim to deep seabed mining, based on the associated mitigation hierarchy (avoid, minimize, remediate). We conclude that the industry cannot at present deliver an outcome of NNL. This results from the vulnerable nature of deep-sea environments to mining impacts, currently limited technological capacity to minimize harm, significant gaps in ecological knowledge, and uncertainties of recovery potential of deep-sea ecosystems. Avoidance and minimization of impacts are therefore the only presently viable means of reducing biodiversity losses from seabed mining. Because of these constraints, when and if deep-sea mining proceeds, it must be approached in a precautionary and step-wise manner to integrate new and developing knowledge. Each step should be subject to explicit environmental management goals, monitoring protocols, and binding standards to avoid serious environmental harm and minimize loss of biodiversity. “Out of kind” measures, an option for compensation currently proposed, cannot replicate biodiversity and ecosystem services lost through mining of the deep seabed and thus cannot be considered true offsets. The ecosystem functions provided by deep-sea biodiversity contribute to a wide range of provisioning services (e.g., the exploitation of fish, energy, pharmaceuticals, and cosmetics), play an essential role in regulatory services (e.g., carbon sequestration) and are important culturally. The level of “acceptable” biodiversity loss in the deep sea requires public, transparent, and well-informed consideration, as well as wide agreement. If accepted, further agreement on how to assess residual losses remaining after the robust implementation of the mitigation hierarchy is also imperative. To ameliorate some of the inter-generational inequity caused by mining-associated biodiversity losses, and only after all NNL measures have been used to the fullest extent, potential compensatory actions would need to be focused on measures to improve the knowledge and protection of the deep sea and to demonstrate benefits that will endure for future generations. There is increasing interest worldwide in the potential for deep-sea mining to serve as an engine for “Blue Growth” and to drive sustainable economic development (European Commission, 2012; Wedding et al., 2015). Most deep-sea ecosystems targeted for mining have some combination of ecological characteristics that make them particularly sensitive to anthropogenic disturbance, such as being largely pristine, highly structured, very diverse, dominated by rare species and (extremely) slow to recover. Accordingly, there is increasing concern that the direct and indirect impacts of mineral extraction in the deep sea will result in a significant loss of biological diversity (herein referred to as biodiversity) (CBD, 1992; Wedding et al., 2015). Direct impacts occur through the removal of target material and associated organisms within the mine site and include the destruction of biota as well as habitat loss, fragmentation, and modification through altered mineral and sediment composition, geomorphology, and biogeochemical processes (Ellis, 2001; Van Dover, 2014; Jones et al., 2017). Potential indirect impacts on the seabed and water column both within and outside of the directly mined area include the smothering of habitat and biota, interference with feeding activities, and the release and spread of nutrient-rich and toxin-laden water from the generation of plumes (Ellis, 2001; Boschen et al., 2013). Additional potentially harmful diffuse effects include those from light, noise and electromagnetic disturbance (Van Dover, 2014; MIDAS, 2016). The scale over which these indirect impacts are likely to occur is largely unknown and most of the effects remain unstudied. The three mineral resource types commonly considered for deep-sea mining each have their own specific environmental contexts, which have each been the subject of targeted scientific study and some proposed management measures—polymetallic nodules (nodules), cobalt crusts (crusts), and seafloor massive sulfides (SMS) associated with hydrothermal vents (vents). However, despite the considerable differences among these resources and the types of ecosystems within which they are located, the scales implicated by deep-sea mining suggest that exploitation of all three resource classes will yield significant biodiversity loss, indicating that a precautionary approach is warranted (Levin et al., 2016). While biodiversity loss is recognized as a major global environmental problem (Weikard, 2002), the importance of biodiversity in the deep ocean merits clarification, particularly given that most species (both prokaryotes and eukaryotes) remain undiscovered or unidentified (Higgs and Attrill, 2015; Sinniger et al., 2016; Shulse et al., 2017). Deep-sea biodiversity is valued both for the ecosystem services it provides and for underpinning the health of the oceans by enabling a range of ecological and evolutionary functions that are viewed as necessary to productive, sustainable ecosystems (Thurber et al., 2014). There is increasing reliance on the provisioning services of the deep sea through fisheries, energy and mineral extraction, pharmaceutical prospecting, and the search for industrial agents and bioinspired materials that all derive from deep-sea biodiversity (Mengerink et al., 2014). Deep-sea communities and organisms also play important roles within climate regulation (through the burial of carbon and mitigation of climate change and ocean acidification) and the production of oxygen (through the recycling of nutrients required by phytoplankton). Biodiversity facilitates the provision of food, refuge, habitat, and nursery grounds for species responsible for the services described above. These services, in addition to the intrinsic values ascribed to biodiversity, are often called natural capital and describe the benefits that humans derive from the effective functioning and existence of biodiversity (Soulé, 1985; Hungate and Cardinale, 2017). In the deep ocean, where there is great uncertainty about natural processes, vulnerabilities and the consequences of human impacts, biodiversity serves as a form of evolutionary insurance, acting as a living library that facilitates adaptation and ecosystem resilience to changing environmental conditions (Mace et al., 2014). With the current absence of a detailed understanding of ecological relationships, the precautionary approach advocated by several international commitments and legal obligations including that of the Convention on Biological Diversity (CBD, 1992) suggests that we assume that healthy, functioning deep-sea biodiversity is, as in other realms, highly desirable and provides services beneficial to humankind. In recognizing the importance of the marine environment and its living resources, the United Nations Convention on the Law of the Sea (UNCLOS, 1982) sets forth a prescriptive regime for the seabed “Area” beyond national jurisdiction and its mineral resources, designed to achieve international control, sharing of benefits (monetary and non-monetary), and environmental protection. UNCLOS designates the international deep seabed and its mineral resources as the “Common Heritage of Mankind,” to be managed on behalf of humankind as a whole, including future generations (Bourrel et al., 2016; Jaeckel et al., 2017; UNCLOS, Art. 136). The International Seabed Authority (ISA), established under UNCLOS, regulates mining activities (to date limited to exploration) on the international seabed and is required to take measures necessary to ensure the “effective protection of the marine environment from harmful effects”, “the prevention, reduction and control of pollution and other hazards to the marine environment” and “the prevention of damage to the flora and fauna of the marine environment” that might arise from mining (Levin et al., 2016; UNCLOS, Arts. 137, 145, 153). Moreover, the international community has recognized the importance of biodiversity conservation more broadly (CBD, 1992; UNGA, 1995, 2006), which should inform the management of deep-sea mining. With the prospect of commercial mining approaching, the ISA is drafting exploitation regulations that also address environmental considerations. One aspect that the ISA will need to consider is whether the current best practice of other extractive industries, specifically the application of the mitigation hierarchy (IFC, 2012; Ekstrom et al., 2015), can be effectively used in the vent, seamount, and abyssal deep-sea ecosystems likely to be affected by mining. Here we critically address the challenges of applying the different phases of the mitigation hierarchy to deep-sea mining with the specific aim of no net loss (NNL) of biodiversity. We also consider the recent suggestion that biodiversity offsetting could be employed in the context of deep-seabed mining (ISA, 2016). We first explore the application of NNL to the deep ocean and examine possible avenues for avoiding, minimizing, and remediating adverse effects. We next appraise the potential of biodiversity offsetting, the last resort in the tiered mitigation hierarchy, to address residual and unavoidable harm. Recognizing that the primary obligation of the ISA is to prevent harm to the marine environment, if deep-sea mining is allowed to proceed without adhering to an aim of NNL the benefits arising from any compensatory actions should be considered to outweigh the losses of deep-sea ecosystems and services to humankind as a whole. Here we also explore the difficult question of what considerations ought to be required of any agreed compensatory action should such a scenario arise. A key tool in environmental management is the mitigation hierarchy (IFC, 2012), which is applied in environmental impact assessment (EIA) and management planning, and is also commonly required by financial institutions and regulatory frameworks (Figure 1). Based on an assessment of the potential environmental impacts of an activity, measures to avoid and then minimize the impacts as far as possible are undertaken. After this, opportunities to remediate (i.e., reverse the residual impacts) should be considered before exploring the last resort of biodiversity offsets to address any unavoidable impacts (Ekstrom et al., 2015). Offsetting most commonly involves restoration to assist in the recovery of a quantum of degraded, damaged or destroyed ecosystem equivalent to that lost; and can be active (e.g., replanting, construction of artificial habitats) or passive (e.g., removing threats to promote natural recovery) in nature (Perrow and Davy, 2002; SER, 2004). Sustainable management of resource extraction is of increasing importance to governments and industry alike. In response, aims of NNL or even net gain of biodiversity have been adopted within some public and private policies as part of the mitigation hierarchy (Bull et al., 2013; Le et al., 2017; Niner et al., 2017a). This uptake appears to be increasing despite limited evidence as to the success of the mitigation hierarchy and offsets to realize these aims (Maron et al., 2015b; Gibbons et al., 2017; Lindenmayer et al., 2017). While not yet applied in deep-sea management, NNL is becoming increasingly accepted by established extractive industries such as terrestrial mining and oil and gas operations including those operating offshore in shallower waters (ICMM, 2005; Rio Tinto, 2008; Bayon and Jenkins, 2010; BHP Billiton, 2012; Benabou, 2014; Rainey et al., 2014). Figure 1. The mitigation hierarchy as applied in its intended sequence and the challenges posed by deep sea application. Defining what is meant by NNL is critical to its implementation and assessment; however, this detail is seldom provided in offsetting policy (Maron et al., 2015a). NNL suggests that the total “amount” of biodiversity should not be altered by an activity. However, the term “biodiversity” itself also requires definition as interpretation can vary across a range of spatial scales and metrics including those describing genetic diversity, species richness, evenness, species turnover, habitat heterogeneity, ecosystem function, and community or taxonomic distinctness (Sarkar and Margules, 2002; Magurran, 2004). The data requirements for each of these descriptors may be different and the acceptability of potential remediation or offsetting options will vary with the metrics used (Bruggeman et al., 2005, 2009). For example, NNL of ecosystem function or functional diversity, as opposed to species richness, allows for an alternate definition of remediation to include rehabilitation where the full suite of functions are restored across the region even in the absence of the return of all original species (Van Andel et al., 2012). In the case of deep-sea mining, even if a purely functional definition of NNL were to be adopted, defining an ecologically relevant measure of extent and functionality based on current scientific understanding would be extremely challenging. Furthermore, such definitions could mask the risk of local and regional species extinctions and the diminished resilience of ecosystem services (Donohue et al., 2016). Whatever surrogates and methods are employed to measure biodiversity changes in the deep sea, they should be appropriate for assessing management measures and whether adequate protection is being acheived (Magurran, 1988; Bull et al., 2016). Recent correspondence by Van Dover et al. (2017) and others have questioned the feasibility of an aim of NNL in marine environments and for the deep-sea mining industry. Specifically, OECD and IUCN policy guidelines suggest that offsets are not appropriate where there is uncertainty about the severity, vulnerability, and irreplaceability of biodiversity components lost and gained (IUCN, 2016; OECD, 2016). Particular challenges in the deep ocean relate to the availability of baseline data (including the large number of unsampled and undescribed species), current abilities to measure and monitor biodiversity losses and gains resulting from human activities such as mining, and a complete lack of proven success in assisted ecological restoration. Studies of biodiversity in the deep sea are challenging owing to cost, remoteness, immense spatial scales, processes that unfold over long time scales (e.g., centuries to millennia for expected recovery from some deep-sea mining impacts), and limited expertise. These factors result in a high degree of uncertainty in (i) local and regional assessments of biodiversity (active hydrothermal vents on local scales are best known but still not fully understood); (ii) the effects of human activities in space and time on biodiversity; and, (iii) the extent to which components of deep-sea biodiversity are vulnerable and irreplaceable. Further complicating impact quantification is the need to account for future scenarios that would unfold in the absence of the impact or offsetting action; these need to integrate current and future effects from other ecosystems stressors such as climate-driven changes (Smith et al., 2008a; Levin et al., 2016). As a result, there is substantial uncertainty associated with EIA and consequent implementation of the mitigation hierarchy for deep-sea projects owing to a lack of ecological and biogeographic knowledge (Smith et al., 2008a; Amon et al., 2016; Levin et al., 2016; Jones et al., 2017). These challenges are compounded by the frequent absence of defined property rights or effective laws that provide for the control of access by others to an area. Without the authority to restrict access to an area, protection for restoration from other damaging uses such as fishing is not possible. The combination of these issues complicates each step of the mitigation hierarchy in deep-sea environments. Indeed, the Environmental Protection Authority of New Zealand referred to the inadequate application of the mitigation hierarchy as a reason for its refusal of the application of Chatham Rock Phosphate Ltd to mine phosphate off New Zealand (NZ EPA, 2015). The decision specified the absence of (1) impact quantification, (2) planned interventions to minimize impacts, and (3) evidence of the effectiveness of measures to support the reversal of impacts as contributing to their decision (NZ EPA, 2015; UNEP-WCMC, 2016). In the next section, we explore these challenges and conditions for applying the mitigation hierarchy appropriately. The first step in the mitigation hierarchy is avoidance, whereby a measure, once designed into a project, does not require continued effort to remove impacts (Bull et al., 2016). Deep-sea mining will involve direct removal of targeted habitat, yielding loss, fragmentation, and modification of that habitat as well as mortality of associated fauna (Ellis, 2001; Van Dover, 2014; Jones et al., 2017). Given the inevitably destructive nature of the activity, the avoidance of significant biodiversity losses is unlikely to be achievable for some or even most projects (Van Dover et al., 2017). Some impacts might be avoided at a project-level by reducing the footprint of mining within a contracted area and/or by leaving some minerals with associated fauna in place and undisturbed, e.g., through reticulated extraction patterns that leave large, contiguous areas undisturbed by direct mining. However, given that many effects of mining will involve three-dimensional, diffuse, poorly understood, and wide-ranging impacts from sediment plumes, toxicity and noise, the identification of refuge areas free from damaging impacts will not be straight-forward (Ellis, 2001; Thiel et al., 2001; Van Dover, 2014). This is evidenced by the inability to identify control sites unaffected by the resettlement of material in the Disturbance and recolonoization (DISCOL) experiment conducted to help evaluate potential deep-sea mining impacts (Thiel et al., 2001). Identification of such refugia will require both modeling and in-situ studies at multiple levels and over various time frames (e.g., the expected decadal duration of nodule mining), to include project, regional, and cumulative impacts. The regulatory framework will need to be both precautionary and adaptive to allow responses such as the cessation/relocation of mining or the modification of impact-free refugia as new data become available and prior to reaching the point of serious harm (Levin et al., 2016). Nonetheless, even with plume management and impact-free refugia, negative impacts, and biodiversity loss will be unavoidable. The second step in the mitigation hierarchy is to minimize losses of biodiversity and other ecosystem damage to the greatest extent possible. Minimization measures include activities that require on-going activity to reduce the significance of impacts (Bull et al., 2016). In the case of deep-sea mining, technologies and practices might be developed and applied to reduce these risks. For example, sediment plumes generated during mineral extraction are considered to be a source of major risk to deep-sea ecosystems resulting in, among other effects, the burial and clogging of animals' feeding apparatus. Investing in engineering design and in situ testing of mining tools, including installation and testing of shrouds on cutters, and minimizing the creation of pulverized fine material, might reduce sediment plume dispersion and the spatial extent and temporal persistence of some plume impacts. Other technical innovations might include the design of vehicles to reduce compaction of the seabed and turbulence, or a change in waste disposal techniques to reduce ecotoxicological effects. However, because the industry is in its infancy, the effectiveness of such measures in reducing losses of biodiversity remains wholly untested. Again, regulatory mechanisms, including environmental objectives with precautionary indicators, will be necessary to stimulate the innovation and uptake of improved technologies. Despite the potential to reduce impacts in the future, the destructive nature of mining indicates that current technologies will be unable to avert significant local biodiversity losses through avoidance and minimization. Species extinction rates typically increase exponentially with the percentage of essential habitat lost (Ney-Nifle and Mangel, 2000); thus, biodiversity loss from mining is likely to scale to the ratio of habitat area impacted to the total area of that habitat within the biogeographical province. Biodiversity loss will also be affected by levels of abundance and endemism within a habitat, and rates of population connectivity (Ney-Nifle and Mangel, 2000). To account for these varying impact pathways, minimization efforts should incorporate spatial planning that considers species ranges, habitat distributions, and patterns of connectivity to determine where and how much mining will be allowed to occur (e.g., to avoid massive habitat loss within a single biogeographic province leading to extinction of species requiring that habitat). The third step of the mitigation hierarchy, remediation, seeks to address losses of biodiversity associated with mining after the first two steps of the mitigation hierarchy have been considered and implemented to the greatest extent possible. Remediation under an aim of NNL implies that a reversal of damages incurred by the associated activity is required and feasible (Bull et al., 2016). Requirements for post-mining site remediation are now commonplace for terrestrial projects (Lamb et al., 2015) but a similar approach for the deep sea will face numerous challenges. These challenges include the slow recruitment and growth of the native species that occur in target habitats (manganese nodule fields, seamounts, and sulfide deposits), the potentially vast scales of mining impacts, the limited understanding of the requirements for proper ecosystem function, and the likely high cost of deployment of assisted regeneration strategies and monitoring in the deep sea (Van Dover et al., 2014). Effectiveness and practicability of any remediation technologies or methods at the scale required to address deep-sea mining impacts and achieve NNL has not been demonstrated. Remediation for nodule mining is especially problematic considering the temporal and spatial scales involved. For example, one 30-year nodule mining operation may involve a contract area of 75,000 km2 roughly the size of Austria or Tasmania, with direct impacts potentially affecting 20–30% of this area (Smith et al., 2008b). There is little evidence of recovery of biodiversity in nodule beds following relatively small-scale, low-intensity disturbances, even after several decades (Miljutin et al., 2011; Vanreusel et al., 2016; Jones et al., 2017). While a nascent academic field of deep-sea benthic assisted restoration science exists (Strömberg et al., 2010; MERCES, 20171), that work is decades away from contributing reliably and responsibly to industrial-scale reduction of biodiversity loss, and it is still unclear whether deep-sea restoration is feasible at all. Although the technology for remediation may appear relatively simple in some respects, for example deploying simulated nodules to the seafloor in mined areas, the remediation scales (of order 10,000 km2) are daunting, the efficacy of remediation approaches is unknown and will require decades to evaluate (due to the very slow recovery rates of abyssal communities) and run a high risk of failure which could implicate further biodiversity loss. Even if benthic remediation were technically feasible, it would be further complicated by the extended timespans over which financial commitment would be required. The long recovery periods of most deep-sea environments (excluding some active vent fields), likely to be in the order of decades to centuries, would extend beyond the duration of typical mining contracts. The question then arises as to where responsibility for remediation of a former mine site lies once a mining contract has expired but commitments remain outstanding. An increasing concern with schemes for ecological remediation of terrestrial mine sites, where development consent conditions often require a return to pre-impact ecological condition post activity, relates to the “selling off” of concessions and accompanying environmental liabilities to smaller, less financially stable companies. Smaller companies may be less likely to possess the required expertise, experience, and financial resources to manage the long-term commitment posed by remediation (Lamb et al., 2015). In the case of deep-sea mining in the Area it would be the responsibility of the ISA, together with the relevant sponsoring state, to ensure all long-term environmental commitments by the contractor are sustained, even beyond the contractual period. This may require the use of environmental bonds or similar financial instruments (ISA, 2017) to ensure the contractor is not able to shift responsibility to another entity. Given these ecological, practical and legal challenges, it is likely that residual significant impacts will remain after the first three steps of mitigation hierarchy have been implemented, leading to a potential reliance on biodiversity offsets to meet an aim of NNL, but these too may prove problematic. Biodiversity offsets are, the last resort of the mitigation hierarchy and are employed to manage residual impacts after the full and robust implementation of avoidance and minimization strategies. They are considered to be “measurable conservation outcomes resulting from actions designed to compensate for residual biodiversity impacts arising from project development after appropriate prevention and mitigation actions have been taken” (BBOP, 2012), with “demonstrably quantifiable equivalence between what is lost and gained” (Bull et al., 2016). The three criteria central to an aim of NNL include the prediction and measurement of biodiversity changes (losses and gains), the provision of evidence to support claims of additionality, and ecological equivalence. These criteria, particularly that of additionality, are designed to ensure that the net balance of biodiversity is only ever measured against the scenario most likely to have occurred in the absence of impact or compensatory intervention (Ferraro and Pattanayak, 2006). The strict application of these criteria, essential to realize an aim of NNL and to avoid offset misuse, have been found to be challenging in marine contexts (UNEP-WCMC, 2016; Niner et al., 2017b). The gaps in current ecological knowledge and restoration abilities in the deep sea are also inconsistent with use of assisted biodiversity recovery as an appropriate offset mechanism. As such, offsetting through averting loss might present the only option by which the condition of equivalence could currently be addressed. This averted loss offsetting mechanism is meant to create biodiversity benefit by protecting biodiversity that in the absence of the action, would have been lost. The effect is thus to improve current negative trends in biodiversity of a type similar to that lost. Averted loss benefits arise by removing ecosystem threats, preventing harm from other human activities not associated with the project in question, and in some cases by allowing for natural remediation (Ekstrom et al., 2015). For habitats where seabed mining is likely to be the only major threat, averted loss offsets would not be possible. Such habitats include nodule fields or SMS deposits. However, averted loss offsets might, in theory, be plausible for crust mining as some seamounts are threatened by mining and fishing. Therefore, biodiversity loss attributed to mining could conceivably be offset by protecting equivalent unmined areas from the impacts of bottom-contact fishing and future exploitation through mining. However, the additionality of these efforts would be difficult to establish in light of the United Nations General Assembly resolutions which already commit states to “prevent significant adverse impacts” on vulnerable marine ecosystems, including seamounts, from the impacts of deep-sea fisheries (UNGA, 2006). These commitments have been translated into binding regulations by most of the regional fisheries management organizations (RFMOs) with the legal competence to manage bottom fisheries on the high seas (Gianni et al., 2016). Further, unlike on land where property rights commonly exist, the ability of one international agency (e.g., the ISA) to restrict activities regulated by another competent organization (e.g., RFMOs) in the Area is limited. Accordingly, “buying out” industry players with access to an area would provide little guarantee of protection in areas beyond national jurisdiction (ABNJ) if others unaffected by the financial transaction could move into the protected area (Table 1). Given that the ISA has limited jurisdiction applying only to activities associated with seafloor minerals, protecting an area through preventing access would only be possible through international agreement (such as through measures adopted by the relevant RFMO) and only if effective enforcement mechanisms existed. The developing treaty on biodiversity beyond national jurisdiction (BBNJ) may provide a more coordinated approach to the establishment of area-based measures for the protection of marine biodiversity, but at present, such coordination would have to proceed on a very slow and labor intensive case-by-case basis (Freestone et al., 2014). Table 1. Options for the final step of the mitigation hierarchy and barriers to their effective application in the deep sea. Offsetting through averted loss could also theoretically apply if an area to be mined is converted to a no-mining area. However, as the seafloor is presently under exploration only and there is no exploitation contract in place in the Area, proving that likely exploitation has been averted will be difficult. Protection of important or significant areas inside mining areas may also be a required component of a contractor's environmental management plan (EMP) to preserve rare or fragile ecosystems and for long-term scientific research and monitoring. A further challenge results from the requirement of contractors to setup preservation reference zones in their claim areas. These zones will need to be ecologically similar to mined areas, but unperturbed by mining, in order to monitor mining impacts (ISA, 2010, 2011, 2012, 2013). However, because unimpacted reference zones are already required by ISA guidelines, they do not provide the additionality required to be considered as an offset. Extending or increasing these Preservation Reference Zones beyond what will be contractually required within mining concessions could, however, present an option for offsetting biodiversity losses if it could be shown that there was a real (direct or indirect) risk of their future degradation from mining impacts. Without ascertaining this additionality these measures might be used to effectively mask biodiversity losses through “protecting” areas that weren't economically attractive to industry and therefore unlikely to be threatened (Table 1). This approach has been adopted by Nautilus Minerals Niugini Ltd, where predicted biodiversity losses associated with the Solwara I project have been “mitigated” to provide colonists to assist with post-mining regeneration (there was no requirement to meet an aim of NNL) by leaving a nearby site, South Su, unmined (Coffey Natural Systems Pty Ltd, 2008). Notwithstanding the fact that Solwara I and South Su feature different assemblages and so would unlikely meet an aim of NNL, in order for this to be considered as an offset, evidence to prove that South Su would otherwise be targeted for mining is required. The term “biodiversity offset” is frequently misapplied and misused (Bull et al., 2016). True offsets require the provision of new and additional biodiversity benefits and “measurable and commensurate gains” (Bull et al., 2016). 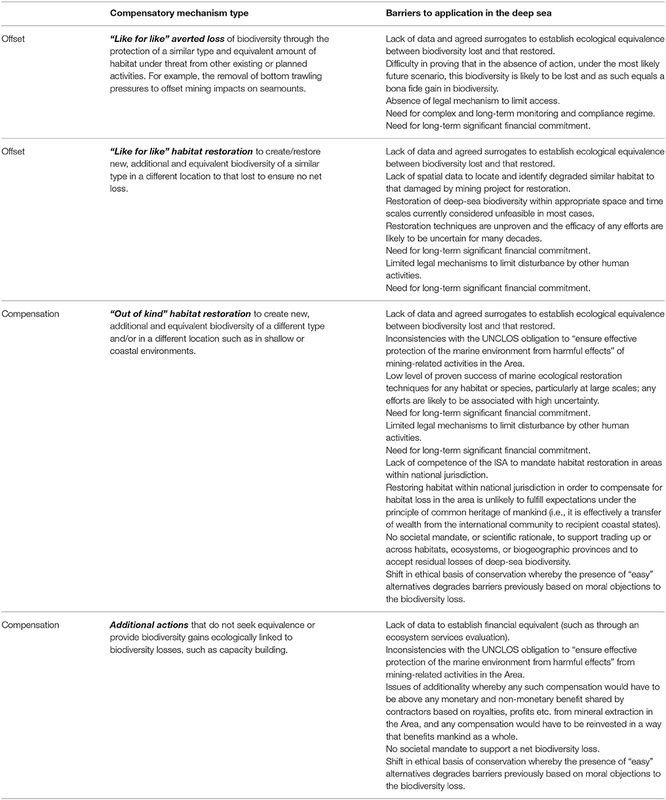 “In kind” or “like for like” offsets refer to conservation actions designed to benefit a similar habitat or the same species/communities, allowing for an assessment of ecological equivalence (Table 1). Where equivalence is not demonstrated, such activities cannot be referred to as offsets and should be more accurately termed compensatory measures (Bull et al., 2016). Determining whether a gain in one type of biodiversity compensates for the loss of another type is probably not scientifically or ethically justifiable in the deep sea, especially given the uncertainties that pervade such environments (Table 1). This issue becomes increasingly scientifically challenging as the ecological and evolutionary distance between a mining impact area and an “out of kind” compensation action increases, especially if the actions ultimately promote ecosystem functions and services that fundamentally differ from those that were lost. “Out of kind” measures should not be called biodiversity offsets as these involve a trade across dissimilar biodiversity, where losses of one biodiversity type are accepted in place of benefits for different habitats, species and/or communities. Accepting and clearly communicating that these “out of kind” actions do not offset biodiversity loss is important to avoid misinterpretation of the trade-offs and losses implicated in decisions to progress with deep-sea mining projects. “Trading up,” a controversial and “out of kind” conservation action to yield gains in biodiversity in areas considered to be of higher conservation value (BBOP, 2012), has been proposed as a compensatory action, incorrectly labeled as a possible offset, for impacts associated with deep-sea mining. For example, it has been suggested that damage in the deep sea from mining (which will inevitably involve biodiversity loss) might be compensated or offset through an “International Marine Mitigation Bank” (ECO, 2016; ISA, 2016; Fish Reef Project, 2017), which deploys “reef balls”—concrete substrata—to promote coral-reef habitat and biodiversity in shallow-water ecosystems. This and other “trading-up” practices assume that loss of largely unknown species and ecosystems in the deep sea can be exchanged for protecting biodiversity elsewhere. From a scientific perspective, such an assumption is highly questionable. In our view, the relationship between any gain in biodiversity in a shallow-water coral-reef setting and loss of biodiversity in the deep sea is too ambiguous to be scientifically meaningful and cannot be considered to be offsetting deep-sea biodiversity loss (Table 1). Moreover, compensating biodiversity loss in the Area with environmental restoration in coastal waters is legally problematic because the ISA's jurisdiction is limited to the Area. Additionally, under the principle of the Common Heritage of Mankind, measurable benefits of mining activities on the international seabed, which include those relating to biodiversity, must accrue to the international community as a whole and particularly to developing states (Jaeckel et al., 2016; UNCLOS, Art. 150). Compensating a few coastal states for a loss of biodiversity that occurs in areas beyond their national jurisdictions would in effect constitute a transfer of natural wealth. Such a scheme appears contrary to the historic intentions of UNCLOS (Nandan et al., 2002) and the Common Heritage of Mankind principle wherein the ISA acts as a trustee for mankind in perpetuity with benefits to be shared equitably (Wolfrum, 1983). These legal concerns may not apply where both mining and a “trading-up” conservation action take place in national waters, although the scientific and ethical concerns remain. Similarly, no-mining areas, referred to by the ISA as “Areas of Particular Environmental Interest” (APEIs) (ISA, 2011; Wedding et al., 2015) have been incorrectly characterized by some as “strategic offsets” in international waters (Johnson and Ferreira, 2015; IUCN, 2016). Notably, they do not provide new and additional biodiversity benefits and thus do not actually offset residual losses of biodiversity that might be incurred by a mining project. Therefore, these are more accurately seen, not as offsets, but as part of a conservation plan to avoid irreversible harm from the extirpation of species or loss of ecosystem function in the mining region. Industrial-scale remediation is not demonstrated and likely not feasible, and offsets are impossible, as such it can be reasonably expected that deep-sea mining will result in a net loss of biodiversity in the direct mining footprint and for some distance around it (Levin et al., 2016; Van Dover et al., 2017). These losses may well be irreversible on timescales relevant to management and possibly for many human generations (Amon et al., 2016; Vanreusel et al., 2016; Jones et al., 2017). If neighboring areas are protected from mining and its effects (such as through APEIs), these can be expected to mitigate the ecological damage on a regional scale, and may assist in some local re-colonization and regeneration. Such no-mining areas can be expected to feature as an important mechanism to avoid and minimize some biodiversity loss. However, despite their advantages, protected areas cannot be expected prima facie to avert all biodiversity losses associated with mining. Furthermore, protected areas cannot be construed as being offsets because no new gains in biodiversity will have been created. Owing to our current limited knowledge of deep-sea ecosystem structure and function, we cannot determine the significance and therefore acceptability of the likely biodiversity losses associated with deep-seabed mining. In the face of our ignorance, the precautionary principle requires that we consider the potentially irreversible consequences of any decisions made and ensure that sufficient procedural, substantive, and institutional measures are in place to avoid serious harm (Jaeckel et al., 2017). This would include a transparent and consultative approach to the development of deep-sea mineral exploitation regulations with experts and stakeholders to specify how biodiversity will be measured with sufficient statistical power, what level of net loss of biodiversity and accompanying ecosystem function might be deemed acceptable, and what form of compensation will be provided for the harm that is caused. While we consider the risks to biodiversity loss from deep-sea mining to be high, the push within the ISA to develop exploitation regulations indicates that the industry may be progressed prior to an open dialogue on whether such biodiversity losses are ecologically or economically justifiable in terms of its benefit to humankind as a whole (Kim, 2017). Should deep-sea biodiversity losses and the associated risks of degraded ecosystem services through mining be found to be both justifiable and acceptable, then it is possible, despite scientific concerns, that “out of kind” compensation will be stipulated at the fourth and final stage of the mitigation hierarchy. Given the difficulty in quantifying equivalence across different ecosystems and types of biodiversity, the outcomes of potential compensatory actions may be reduced to financial rather than ecological benefits. The quantification of financial sums would need to be linked to the value of biodiversity loss, calculated based in part on the total value (both instrumental and intrinsic) of the natural capital lost. Based on the Common Heritage of Mankind, the interests of society as a whole, including lost opportunities to future generations, must also be included in such assessment. Given the importance of deep-sea ecosystem services, the levels of evolutionary novelty, and the challenges of restoration as outlined, calculations would be complex and the sums could conceivably be immense. Ethically, potential compensatory actions beg the difficult question: is one form of life, or evolutionary pathway, equivalent to another? Can the living elements of biodiversity be treated, and traded, as though part of a single currency, even though each species, habitat and evolutionary pathway is unique? And if so, how will the exchange values be set? Can the preservation and recovery of one form of life legitimize the destruction of others (Soulé, 1985)? A further concern is that the acceptance of loss during a biodiversity trade engenders a shift in the ethics of biodiversity protection previously based on moral objection (Ives and Bekessy, 2015; Spash, 2015) and reduces societal pressures to reject proposals with associated environmental damage (Table 1). Finally, establishing a marketplace on nature assumes that when components from one ecosystem are exchanged for others, the outcomes are manageable (i.e., the currency allows for easy and equal exchange between units). Unpleasant, possibly irreversible, “surprises” that characterize complex systems built upon unique components, such as found in deep-sea environments, are not taken into account to allow for trading to take place. If potential compensatory actions are required, these should be limited to actions that benefit the understanding and conservation of deep-sea biodiversity. Capacity building for deep-sea biodiversity research and conservation is one such measure. Again, any capacity-building action on the part of a contractor would have to be in addition to the capacity building already required by the sponsoring State or ISA (ISA, 2010, 2012, 2013). Investment in research on biodiversity in the deep sea, including advancing understanding of minimization and remediation of mining disturbances, might serve as a potential compensatory action. However, to qualify as a compensatory action, these research activities would need to supplement those required for baseline studies, and for the development of EIAs and monitoring, which are already contractor responsibilities. For example, potential compensatory actions might include biodiversity research at regional scales (i.e., outside claim areas and within APEIs) to provide a broader biogeographic context for interpreting the consequences of mining on biodiversity, test the efficacy of protected-area networks, or to assess the risks of species extinctions (e.g., through quantification of connectivity, and plume contaminant and sound dispersal). Various fund schemes that would charge entities inflicting damage on the seabed to support relevant research on biodiversity in the deep sea have been proposed as possible conservation actions (Barbier et al., 2014; Mengerink et al., 2014; Johnson and Ferreira, 2015). The need for funding of new research, rather than that already required under national laws, the Law of the Sea, and the ISA's Mining Code, will need to be addressed through clear criteria in guidelines and regulations to avoid the displacement of existing commitments. We suggest that this research should have the goal of developing new knowledge and capacity to protect the marine environment. However, it should always be recognized that this additional capacity has been built on the premise of accepted deep-sea biodiversity loss. As exploitation regulations are developed, and contracts for commercial mining in the Area are considered, the inability to achieve and verify a goal of NNL through the mitigation hierarchy should be broadly recognized and debated. If mining is permitted and losses accepted, national governments, the ISA, and deep-sea mining contractors will need to focus even greater attention on the preventive steps of the mitigation hierarchy (avoidance and minimization) using a precautionary and adaptive approach. This should be accompanied by research inside and outside mining areas that add to our knowledge and capacity to better understand and protect deep-sea biodiversity, and that is additional to pre-existing legal requirements (Rainey et al., 2014). Such an approach could involve a staged approach to permitting the development of the industry with a number of small sites of perceived lower risk being exploited to develop mitigatory technologies and to monitor and test predicted impacts (Tinch and van den Hove, 2016). Improved knowledge obtained from a staged strategy should inform the progression of the industry, with future stages of exploitation being contingent on the successful ability to predict and take action to minimize impacts and associated biodiversity loss. Given the very slow natural rates of recovery in most deep-sea ecosystems targeted for mining, loss of biodiversity in the deep sea is inevitable and may be considered to be “forever” on human time scales. In effect, the actions of one generation will affect the common heritage of humankind for many generations to come. To avoid, or at least ameliorate this inter-generational inequity, deep-sea mining should yield demonstrable economic benefits, as well as benefits from compensatory measures for current and future generations. The ecological consequences of a net loss of biodiversity in the deep sea are poorly understood and approaches for avoidance and minimization of losses remain limited and unproven. As the ISA develops regulations for seabed mining, it is essential that the potential significance and consequences of this loss (including for future generations) are clearly communicated, understood and taken into account. Given the potential scale of harm, this matter is deserving of wider inclusive debate, both within the ISA and internationally. The scale of biodiversity loss that may be associated with some types of deep-seabed mining and the very limited ability to understand, remediate and offset these losses in “like for like” settings may well preclude their scientific or social acceptance. The manuscript was coordinated by HN. All authors contributed to conception, drafting and review process. Funding and support leading to this research has been received from National Science Foundation (CV, LL), Pew Charitable Trusts (CV, CS), International Climate Initiative (GOBI; CV), 7th EU Framework (MIDAS #603418; JA, DJ, MG, KG), UK NERC (JA, DJ), EU Horizon 2020 (MERCES #689518, DJ and ATLAS #678760, MG) and the J. M. Kaplan Fund (LL, CS), CIC UNAM (EE). CV and LL received research support from Nautilus Minerals; CS received research support from UK Seabed Resources Development Limited. BBOP (2012). Standard on Biodiversity Offsets. Washington, DC. Bourrel, M., Thiele, T., and Currie, D. (2016). The common of heritage of mankind as a means to assess and advance equity in deep sea mining. Mar. Policy. doi: 10.1016/j.marpol.2016.07.017. [Epub ahead of print]. CBD (1992). Convention on Biological Diversity. 1760 UNTS 79. ECO (2016). Offsetting the Effects of Deep Sea Mining Activities. Environment Coastal & Offshore, 50–53. Available online at: https://www.ecomagazine.com/featured-stories/offsetting-the-effects-of-deep-sea-mining-activities (Accessed March 15, 2018). European Commission (2012). Blue Growth—Opportunities for Marine and Maritime Sustainable Growth. Luxembourg: European Commission. Fish Reef Project (2017). ISA 2017 Speech. Available online at: http://www.fishreef.org/2017/08/frp-attends-2017-united-nations-seabed-authority-session/ (Accessed March 15, 2018). Gianni, M., Fuller, S. D., Currie, D. E. J., Schleit, K., Goldsworthy, L., Pike, B., et al. (2016). How Much Longer Will it Take? A Ten-Year Review of the Implementation of United Nations General Assembly Resolutions 61/105, 64/72 and 66/68 on the Management of Bottom Fisheries in Areas Beyond National Jurisdiction. Deep Sea Conservation Coalition. ISA (2010). Regulations on Prospecting and Exploration for Polymetallic Sulphides in the Area. ISBA/16/A/12/Rev.1 (15 November 2010), amended by ISBA/19/A/12 (25 July 2013) and ISBA/20/A/10 (24 July 2014). ISA (2011). Environmental Management Plan for the Clarion-Clipperton Zone. ISBA/17/LTC/7. ISA (2012). Regulations on Prospecting and Exploration for Cobalt-rich Ferromanganese Crusts in the Area. ISBA/18/A/11 (27 July 2012), amended by ISBA/19/A/12 (25 July 2013). ISA (2013). Regulations on Prospecting and Exploration for Polymetallic Nodules in the Area. ISBA/6/A/18 (13 July 2000), amended by ISBA/19/C/17 (22 July 2013), ISBA/19/A/12 (25 July 2013), and ISBA/20/A/9 (24 July 2014). ISA (2016). ISA 2016 Speech: Observer Fish Reef Project, Agenda Item 8 Annual Report of the Secretary-General. Available online at: https://www.isa.org.jm/document/statement-fish-reef-project (Accessed March 15, 2018). Magurran, A. E. (1988). Ecological Diversity and It's Measurement. Croom Helm. Magurran, A. E. (2004). Measuring Biological Diversity. Blackwell Publishing Ltd.
OECD (2016). Biodiversity Offsets Effective Design and Implementation. Perrow, M. R., and Davy, A. J. (2002). Handbook of Ecological Restoration. Cambridge: Cambridge University Press. SER (2004). The SER International Primer on Ecological Restoration. Tucson. Smith, C. R., Levin, L. A., Koslow, A., Tyler, P. A., Glover, A. G., Division, I. O., et al. (2008b). “The near future of the deep seafloor ecosystems,” in Aquatic Ecosystems Trends and Global Prospects, ed N. Polunin (Cambridge: Cambridge University Press), 334–349. Soulé, M. E. (1985). What is conservation biology? A new synthetic discipline addresses the dynamics and problems of perturbed species, communities, and ecosystems. Bioscience 35, 727–734. Tinch, R., and van den Hove, S. (2016). Report on Policy Options and Associated Valuation and Appraisal Needs and Methods for Deep Sea Mining. MIDAS Deliverable, 9.5, Median Sustainability S. L.
UNCLOS (1982). United Nations Convention on the Law of the Sea (adopted 10 December 1982, entered into force 16 November, 1994) 1833 UNTS 3. UNEP-WCMC (2016). Marine No Net Loss: A Feasibility Assessment of Implementing no Net Loss of Biodiversity in the Sea. Cambridge. UNGA (1995). Agreement for the Implementation of the Provisions of the United Nations Convention on the Law of the Sea of 10 December 1982 Relating to the Conservation and Management of Straddling Fish Stocks and Highly Migratory Fish Stocks (adopted 4 August 1995, entered into force 11 Dec 2001) 2167 UNTS 3. UNGA. UNGA (2006). A/RES/61/105. Sustainable Fisheries, Including Through the 1995 Agreement for the Implementation of the Provisions of the United Nations Convention on the Law of the Sea of 10 December 1982 Relating to the Conservation and Management of Straddling Fish Stocks and Highly Migratory Fish Stocks, and Related Instruments. UNGA. Van Andel, J., Grootjans, A. P., and Aronson, J. (2012). “Unifying concepts,” in Restoration Ecology: The New Frontier 2nd Edn, eds J. V. Andel and J. Aronson (Blackwell Publishing Ltd), 9–22. Wolfrum, R. (1983). The Common Heritage of Mankind. Max Planck Encyclopedia of Public International Law. Copyright © 2018 Niner, Ardron, Escobar, Gianni, Jaeckel, Jones, Levin, Smith, Thiele, Turner, Van Dover, Watling and Gjerde. This is an open-access article distributed under the terms of the Creative Commons Attribution License (CC BY). The use, distribution or reproduction in other forums is permitted, provided the original author(s) and the copyright owner are credited and that the original publication in this journal is cited, in accordance with accepted academic practice. No use, distribution or reproduction is permitted which does not comply with these terms.